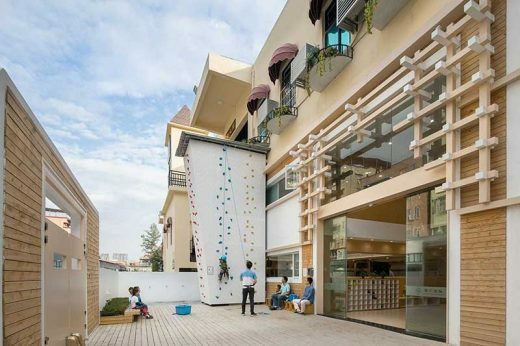 The Lion International Kindergarten is located in an old residential community in the Tianhe District of Guangzhou. Surrounded by old-fashioned houses, the community itself lacks a venue for children’s activities. Children here are in desperate need of a comfortable and safe environment to learn and play. Being an educational institution that encourages young children to explore with freedom, Lion International Kindergarten adheres to the STEAM education philosophy, a system based on the objective integration of “science, technology, engineering, art and mathematics”. Such educational concept is in line with international standards and focuses on the comprehensive development of coordination abilities at a young age. Accordingly, the kindergarten exhorts children to, through physical effort in a free environment, develop observation skills, problem-solving skills, communication abilities, thinking abilities and cooperation skills, all by themselves, further inspiring them to protect the environment and to cherish social responsibility. 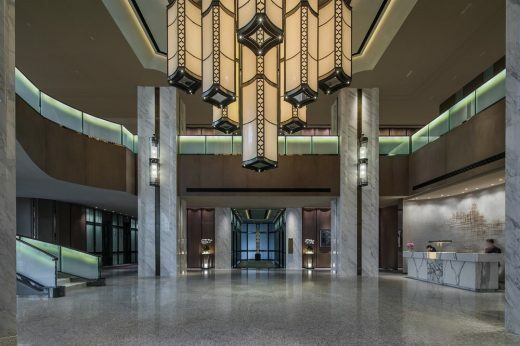 VMDPE designed the interiors of the project to seamlessly integrate with the STEAM concept. The site for the project was an old warehouse less than 7m high, with very confined areas, and a problematic narrow side that limited space to open windows and caused the obstruction of natural light. 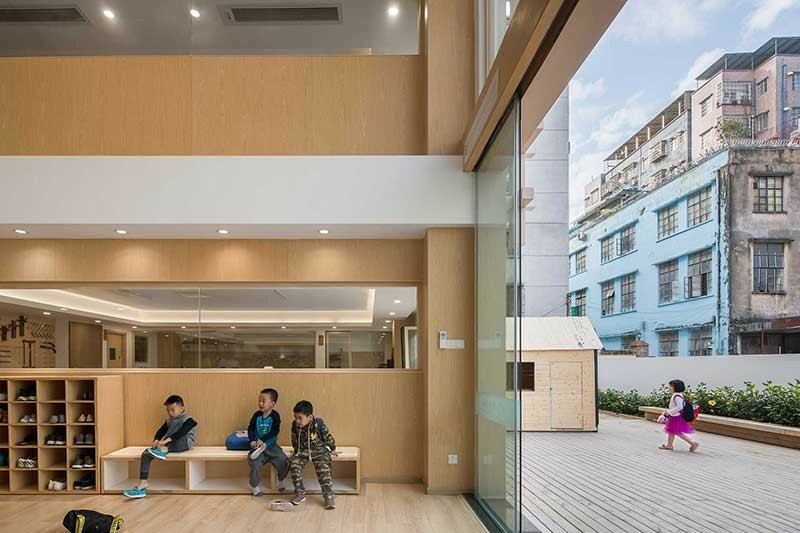 Concerned about the physical and mental health of children, VMDPE decided to extend the general pattern of the available space by dividing the area in two: the front side, arranged as a classroom with plenty of sunshine; and the rear side, an integral space with extended windows to increase the amount of light in the room. 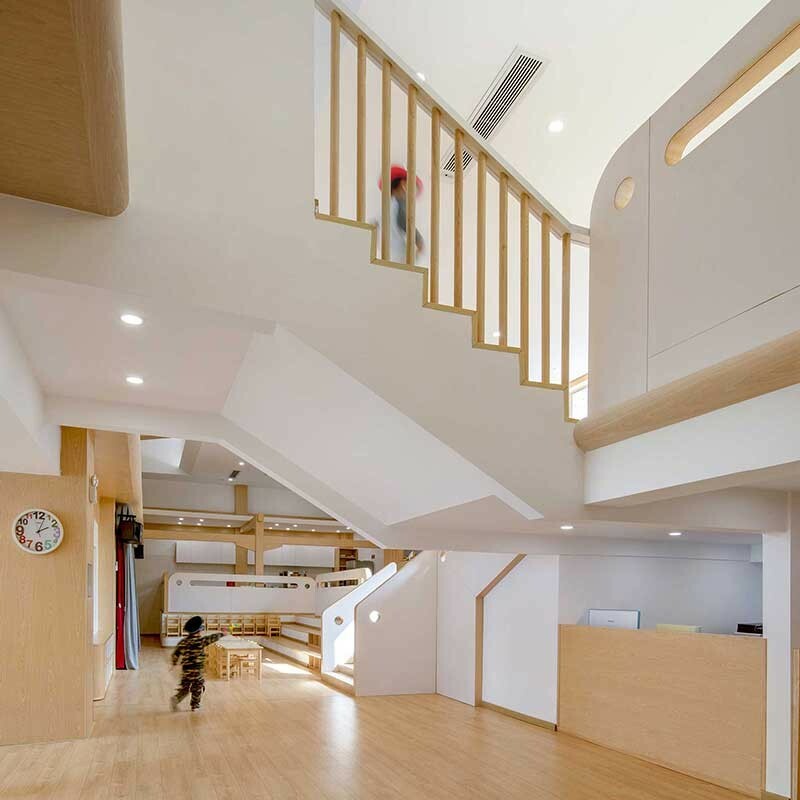 Taking advantage of the building’s height and the large staircase on the interior, more spaces were created for the children to explore and fully develop their nature. Following international education standards, the front was divided into two levels: the first floor, which holds carpentry and dance classrooms; and the second floor, which houses art and science classrooms. Such logical partitions highlight different interaction areas according to the concept of STEAM’s multidisciplinary integrated education. Furthermore, the rear side of the building was transformed into a free exploration space containing the main stairs, a slide, reading stations, an open cooking classroom, a role playing area among other segmented and intersected areas. Moreover, the door on the first floor opens to create an area useful for small shows or outdoor group activities. The design of flexible spaces grants specific functionality to determined areas when needed, thus enriching the educational content available during early childhood. This case in particular was completely designed to improve the concept of early childhood education spaces in China which often lack specific features or clear functionality. Rich indoor activity areas not only help to induce the desire to explore, but also grant children freedom of choice, promoting subjective exploration based on their own hobbies. 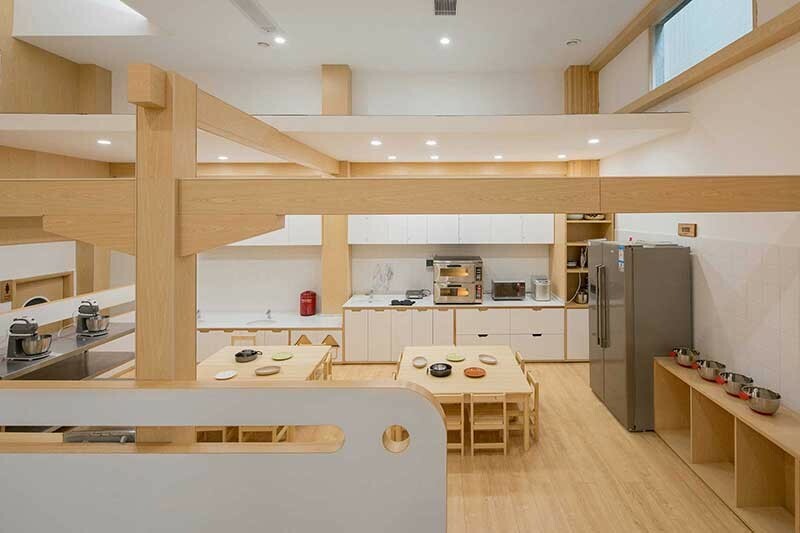 The project mainly portrays natural wood colors in an honest, straightforward design that teaches children the importance of environmental sustainability, as it is promoted by both their educators and the design firm. 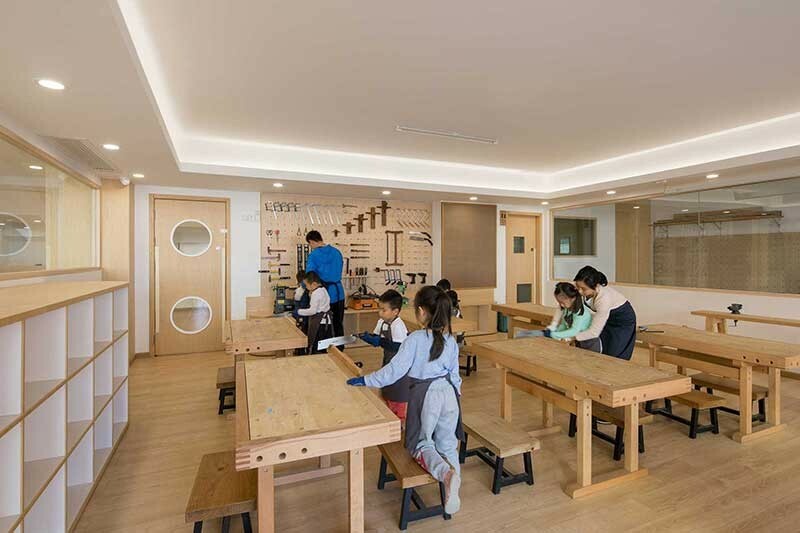 VMDPE specializes in the design of educational spaces for children, with particular attention to safety and environmental protection, through the use of carefully planned modular strategies. To this end, all components are produced off-site. 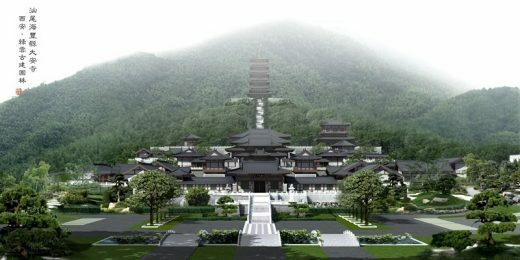 Only final assembly takes place in the building, reducing pollutants and achieving the sustainability goals of the design. VMDPE implements a modular approach to efficiently control both the design process and production costs. 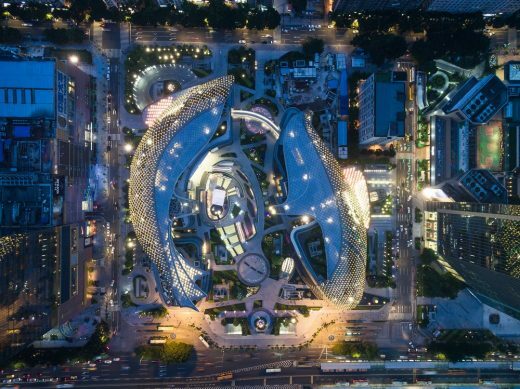 By allocating functionality of space, the production of related modules can be targeted at the start of the design phase, allowing the definition of an accurate budget for the entire project. 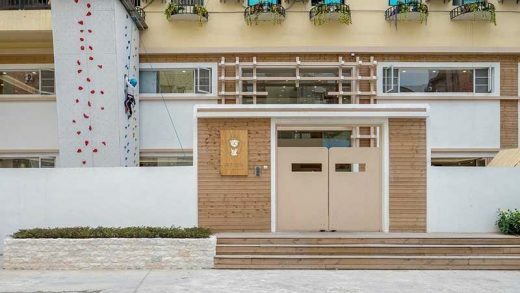 VMDPE’s modular design approach features first-class, healthy and sustainable environments, and even though the project is based in a first-tier city, the cost is moderate and fully complies with the requirements of most educational systems for children in China, including operation and development needs. 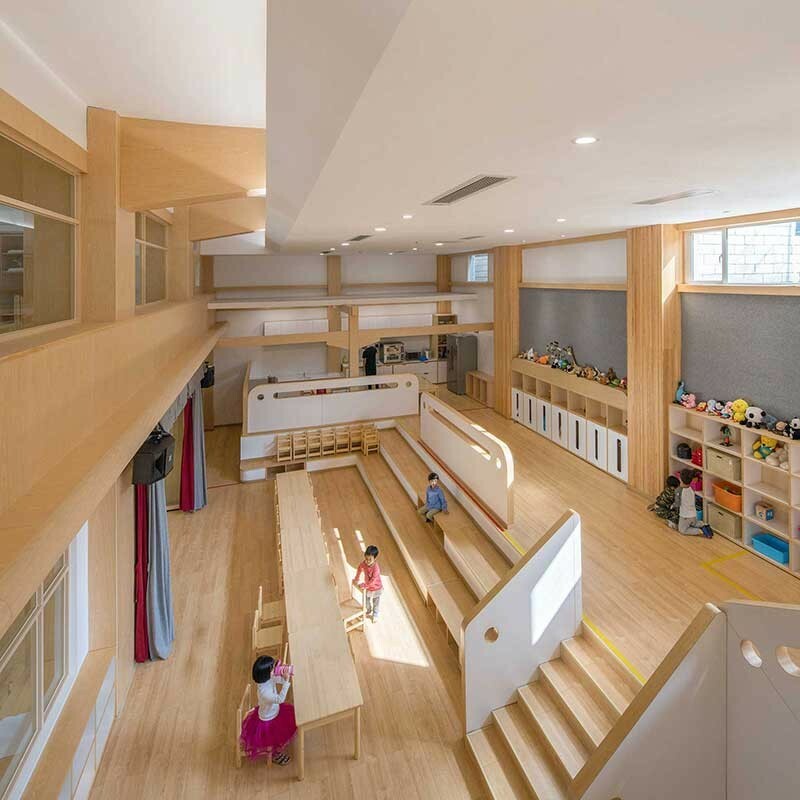 This approach is particularly suitable for high-end brands and chain kindergartens, and also provides guidance to the educational space design market of second and third tier cities in China. The designer selected children friendly materials for every detail of the project. Furniture is custom-made according to the height of every age group. Power outlets and switches are positioned at heights that children cannot reach. VMDPE even provides a solution for the lack of outdoor spaces in children’s educational institutions, by expanding functions of the originally small courtyard. Taking into account that water, sand and stone are the natural elements that children like most, a sand pool and a climbing wall were designed outside the building. 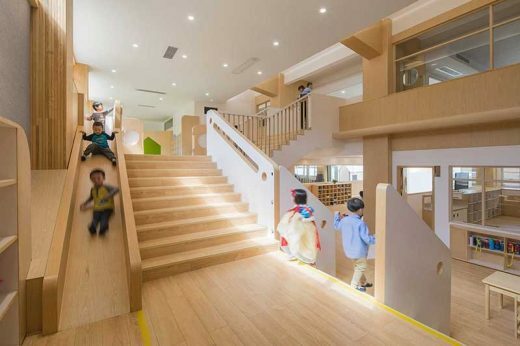 This caters to the growing needs of children of different ages. The Lion International Kindergarten Project truly embodies the development of young children. 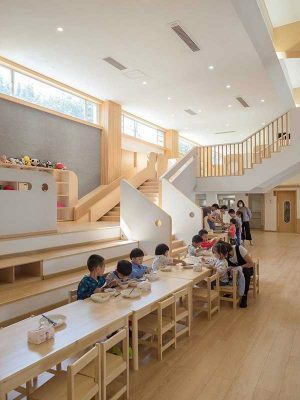 Through rationality and thoughtful design, the core of an international educational space for children’s development has been achieved. With vast experience on early childhood education in China, VMDPE professionally solved the site’s limitations, allowing the kindergarten to meet the educational philosophy of the international brand. 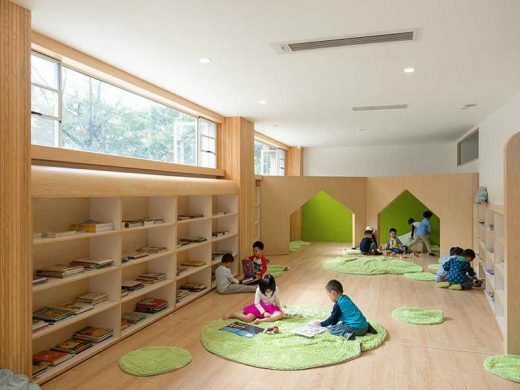 The kindergarten is expected to achieve its social functions in a safe, healthy and sustainable environment.